I don’t think I’ve ever wanted to be Han, Chewie, or Luke – 'The Force' never had much appeal I guess. And while I never wanted to be Jabba either, I do strongly remember thinking it would be cool to be a Stormtrooper and race around in my own Tie Fighter or giant robot dinosaur if the last driver had left it with a full tank o’ gas. 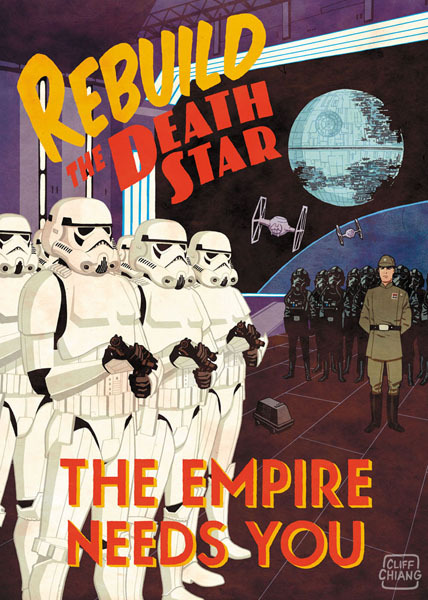 Now a range of artists including Cliff Chiang, have gotten behind the recruitment drive to ensure 'The Empire' stays at empire size, by creating some truly stunning posters. 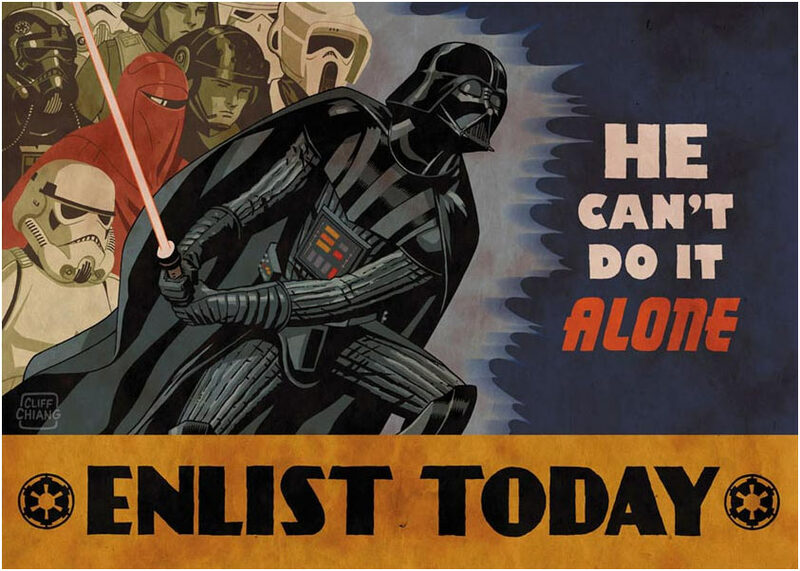 Promoting the benefits of job and the power you’ll become part of, sure redundancy is only a Vader choke stare away, but what career doesn’t have an escape clause somewhere? those are fantastic! the best ones are the loose lips and Imperial Star Destroyer one at the bottom. make sure you read the fine print on that one! but at the same time looking at this stuff bums me out too. i so wish the Star Wars legacy hadn't been sullied by those wretched prequels. Those are great. 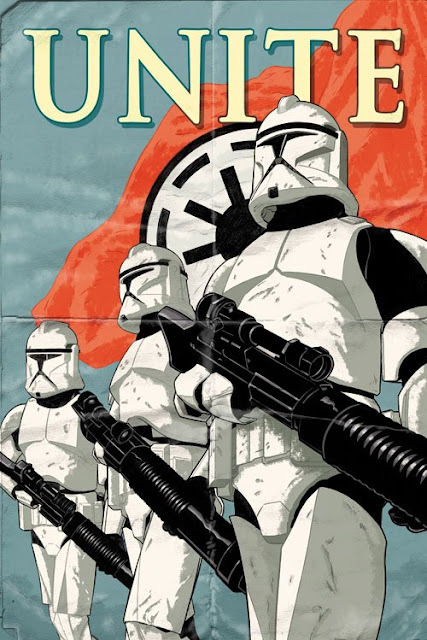 I love the print with the clones with the fake folds and wrinkles worked in. I'm with Dave on the prequel thing. Just goes to show that for all the special effects, money, cameos, and flash pumped into the 3 prequels, they still are inferior films to the original trilogy. crickey! those bloody dingos at Blogger just went and up n jobed my original comment about these ere fantastic posters. this mornin i was like let me have a deco at ya and next thing ya know strewth! not ter mention whot i said about those bleedn prequels just havin soiled the lot. what the devil happened with that bloke lucas anyways!? Yip ol' blogger malfunctioning the other day seems to have wiped a fair few comments from the site Dave! Hopefully they'll all return! And thanks for taking the effort to repost! 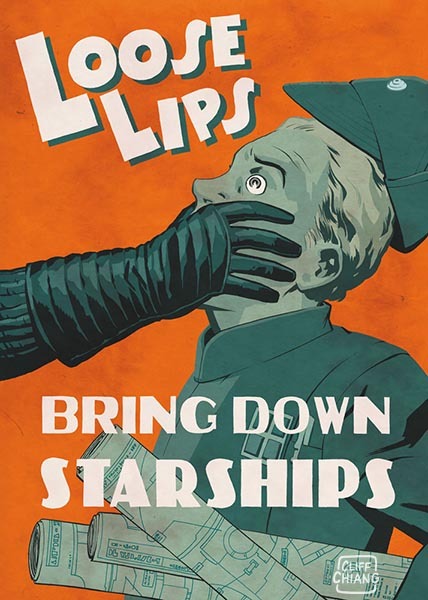 the "Loose Lips" and Imperial Star Destroyer" ones are the best. 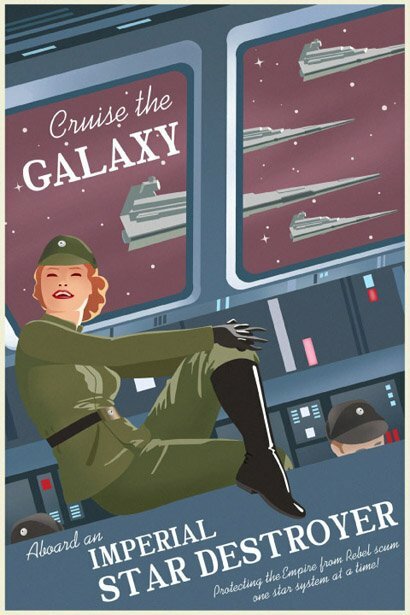 you gotta make sure you read the fine print in the ISD one! wiped my comment off the map too. I'll say it again though, great post. I especially love the "Unite" Poster with it's photoshopped-in wrinkles and folds. Nice touch. I'm with Dave on the prequels though. Just goes to show you can have the best special effects, CGI backgrounds, and cameos from famous actors, but the originals with their superior story beat it every time. Thanks for that Craig! I agree - CGI characters especially don't compete with a decent plot and script!